Are flea and tick collars for dogs safe? Are flea and tick collars effective for dogs? When should a dog flea collar be changed? Do dog flea and tick collars cause cancer? Can a dog flea and tick collar kill a cat? Can I use a dog flea and tick collar on a puppy? Dog flea collars are preventative pest-control methods for protecting dogs against ticks, fleas, and other pests. Tick and flea collars have different active compounds (insecticides) with different levels of efficiencies and potential side-effects. Older dog flea collars have been used less and less because of serious allegations made about their toxicity to dogs, children and even adult humans. Over the last years, many modern and much safer dog flea collars have appeared on the market and they are definitely more efficient. This article is a comprehensive guide to the best dog flea collars, answering the most common questions and interrogations pet parents have before buying these. Please note that tick and flea collars for dogs are great for prevention, they won’t be of much use to treat an existing spread or infestation. In the recent past, we wrote articles about treating a tick and flea infestation, but also a review on the best dog flea shampoos. Fleas and ticks operate similarly but are in fact vastly different. A flea is a six-legged wingless insect with the capacity to jump up to 50 times its body length. On the other hand, a tick is an eight-legged arachnid that neither flies nor jumps. Ticks are more resilient in nature and can grow up to 1cm in length. They can survive up to 3 years in temperatures close to freezing. They can also live by feeding off blood from an extensive list of hosts including dogs, birds, snakes, lizards, opossums, humans, cats, foxes, rodents, deer, raccoons and cattle. Although they spend most of their life cycle jumping from host to host, they also possess patience and can lie dormant for long periods of time until a suitable host appears. A female tick will feed on a host until she is round and engorged. 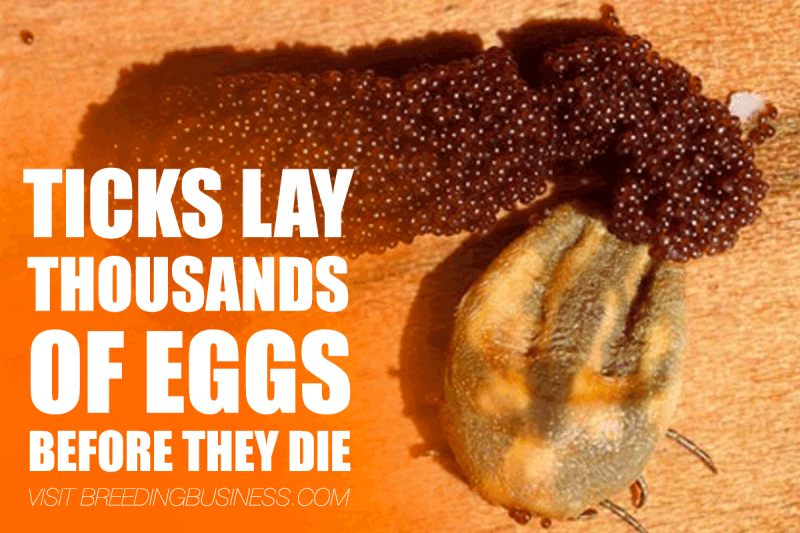 She will then detach and lay up to a thousand eggs where she lands; her death will then follow. Alternatively, fleas, which are approximately 3mm in length, live up to 100 days and prefer warm environments. They have fewer hosts including dogs, coyotes, cats, raccoons, opossums, and foxes. Fleas choose a single host to live on for several weeks until death. They have a strong grip to prevent displacement from the host. Only adult fleas feed on the host, unlike ticks who feed during all phases of life (larvae, nymph or adult) as feeding supports their development. Fleas lay between 20 and 40 eggs on their host daily, after feeding. The host carries eggs in its fur which may fall as it travels, spreading the infestation far and wide. Fleas have a tendency to spread Cestoda (tapeworm) and bartonellosis whilst ticks transmit potentially fatal diseases such as Rocky Mountain Spotted Fever and Lyme Disease; all of which can affect both dogs and humans. Fleas lay 50-100 eggs while ticks lay over a thousand of eggs before they die. Flea and tick collars are considered an effective way to prevent fleas and ticks in dogs, especially if your dog does not suffer from any underlying medical conditions. Insecticide and plastic resin are molded together to create a narrow plastic strip that can be worn around a dog’s neck. The insecticides must be tested and deemed non-toxic to avoid poisoning the dog or irritating its skin. The carefully constructed collars are also designed not to stain fur or have any strong taste or odor that may prove distressing to either dog or owner. Collars come in a standard size (approximately 0.375 inches wide and 0.125 inches thick) that can usually be trimmed by the owner to fit the pet perfectly and the insecticide is embedded in the collar as either a liquid or gas. Flea and tick collars may either emit a gas that is designed to kill fleas when they bite the skin or secrete a liquid which soaks into the dog’s skin, killing fleas and ticks on contact with the skin before they bite. The most successful collars tend to contain a liquid-based insecticide as this can cover a larger surface area. Amitraz: a lucrative anti-parasitic drug usually used to prevent fleas and ticks. The acaricide causes insects to enter a frenzied state which is followed by paralysis and eventually death. It can also be used to treat mange in dogs. Amitraz is very effective but can prove harmful to dogs and humans in high doses. Deltamethrin: synthetically derived from natural pesticide Pyrethrin, which was discovered in the extract of chrysanthemum flowers over 100 years ago. It is one of the safest existing insecticides for mammals and humans. Pyriproxyfen: a pyridine-based pesticide that has a sterilizing effect on flea eggs and larvae so that they are unable to mature and reproduce. It has low acute toxicity. Propoxur: a carbonate insecticide which causes fleas and ticks to die within 24 hours of exposure by targeting their nervous system. Although safe for dogs, it is extremely toxic to humans, so owners must always wash their hands immediately after contact with the collar. Flea and tick collars can be more successful when treating ticks than fleas as ticks tend to be drawn to the face and neck of a dog, which is where the collar sits and where the insecticide is most concentrated. Dog flea collars are more effective at preventing fleas and ticks rather than successfully treating infestations because they are normally too widespread and require a very comprehensive approach to be sorted solely with a collar. In the same way that humans are building up resistance to commonly used antibiotics, it is thought that ticks and fleas may also become resistant to popular over-the-counter treatments. Consequently, many pet owners are finding it increasingly difficult to completely eradicate infestations from their homes. To stop pests building up increased resistance to an active compound, it is important to rotate the type of flea and tick collar used to ensure that stubborn pests are also exterminated. Flea collars may be produced by different brands but what matters the most is the active ingredients they embed in their formula. For the older generation of pet parents, collars were containing tetrachlorvinphos which has been heavily criticized over the last years for its potentially high toxicity for dogs and humans. Bayer, Merck, and other popular laboratories have recently come up with newer products and totally safe flea collars for dogs. Their embed cleaner and more targeted active ingredients such as deltamethrin, imidacloprid, and flumethrin. Experts and governmental entities are now warning against traditional flea collars for dogs because of the risks posed to dogs and their owners. Traditional collars often contain the neurotoxin Tetrachlorvinphos (TCVP) which was first registered as a pesticide in the US in 1966 and has been found to build upon pet fur in dangerous levels. TCVP has been found to cause brain and nervous system defects in dogs and humans. It also has links to cancer and the Environmental Protection Agency has listed Tetrachlorvinphos as a carcinogen. Children are thought to be particularly vulnerable as they have poorer hygiene levels and are therefore more likely to expose themselves to harmful chemicals such as TCVP contained in flea and tick collars, which may subsequently build up in their system. Children are also less developed, and their bodies are less equipped to rid itself of dangerous chemicals. Although hand washing is reported to help protect against the chemical which may be transferred to the mouth, it can also be absorbed through the skin and can irritate the eyes and skin. Many symptoms reported after exposure to TCVP consist of salivation, pulmonary edema, blurred vision, nausea, perspiration, and convulsions. There have been similar concerns about the use of Propoxur and Amitraz so pet owners are always advised to check product labels. We recommend to try it out for a few days and thoroughly check your dog’s skin, children, and yourself to see if all is well. Always know the risks of bringing a new dog flea collar into the home. Experts are also beginning to suggest alternatives to chemical collars such as homeopathic repellent sprays or flea and tick collars containing essential oils such as cedarwood or peppermint that can repel up to 500 different insects. Modern dog flea and tick collars such as Scalibor and Seresto are much safer alternatives to collars containing TCVP. The two products aforementioned contain Deltamethrin for Scalibor, and Imidacloprid as well as Flumethrin for Seresto. Deltamethrin, as previously mentioned, is a naturally occurring pesticide considered to only pose serious health risks to aquatic life and not to dogs or their owners. Seresto is also considered safe for domestic life as although it still contains chemicals that can cause some toxicity at extremely high levels, it has very high safety margins. Seresto collars release Imidacloprid and Flumethrin at a constant steady rate, keeping pests at bay whilst ensuring chemical levels stay low enough to be considered safe. Modern dog flea collars also contain anti-oxidants to prevent sun damage as well as being water resistant and the best collars have a breakaway mechanism to prevent choking or strangulation. It is important to note – whichever chemicals a flea or tick collar contains – that although a collar may be safe for dogs and their owner, this does not necessarily mean they are safe for cats to be exposed to and owners should tread with caution and ask for advice from experts if in doubt. Many modern flea collars have also surpassed traditional flea collars in their ability to spread further than the area around the neck where it sits. Older products tend to release insecticide gas which kills pests around the head and neck but not necessarily at the rear end of the dog, as the toxins may not reach this far. However, newer collars are made in such a way that allows chemicals to be released and replenished continuously, whilst being absorbed and spread by natural oils in the dog’s coat, providing fuller protection. The effectiveness of the treatment will still depend on how well the treatment is absorbed into the dog’s skin which may be affected by multiple factors such as how snuggly the collar fits around the dog’s neck and how often the dog gets wet. Modern flea and tick collars are also likely to contain newer insecticides which fleas and ticks should not yet have built up resistance too, making them more effective. As a dog owner, preventing any tick or flea infestation is crucial but happens to be difficult. Manufacturers are not helping much by presenting a rather confusing offering: spot-on flea treatments, flea shampoo, flea bombs, sprays, and the oldest and most trusted method, tick and flea collars. Anti-flea collars have sunk in popularity a few years ago because of an allegedly toxic pesticide they all used. Manufacturers have put their R&D departments to work and they discovered many different active ingredients that are totally safer, stronger, more targeted and for some of them, totally natural. Today’s flea collars are a lot better and even last longer (some up to 8 months)! Below is our shortlist and review of the top 5 best tick and flea collars for dogs. 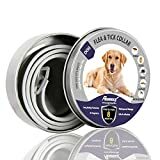 — Absolute Best Tick & Flea Collar For Dogs! Seresto is by far the most popular and best tick and flea collar for dogs! With over ten thousands of wonderful online reviews on many different websites, it is an online bestseller recommended by so many veterinarians that it’s hard to ignore its efficiency. Bayer Seresto has two very strong active ingredients: 10% of Active ingredients: 4.5% of Imidacloprid and 4.5 % of Flumethrin. Seresto is non-greasy, odorless, super easy to put on any dog, and even has a quick release mechanism. By using a single Seresto flea collar, your dog will enjoy 8 full months of excellent protection against fleas, ticks, larvae, lice, and even sarcoptic mange. The greater news is that Seresto can be used on puppies from 7 weeks, unlike other products which only allow pups of at least three months of age. Many other flea control products only kill fleas and ticks while Seresto collars will also repel these parasites so they stay away from your dog altogether. The collar has a slow release and low concentration that is perfect to kill parasites on contact, without them needing to bite to be dead. It’s overall the best dog flea collar you can buy today and it is totally worth its higher price tag. — Best Deltamethrin Dog Collar! Containing 4% of deltamethrin, this tick and flea collar by the world-renowned Merck Laboratories is one of the most popular products out there. My veterinarian was recommending it and it’s a product that has a great legacy, just like Seresto. With the protection of up to 6 months, this deltamethrin dog collar will get rid of fleas, ticks, deer ticks, and a few more parasites with ease. This is one of the strongest over-the-counter flea collars for dogs and should therefore not be touched by children and puppies younger than 3 months. Merck itself is asking dog owners to consult with a veterinarian before allowing pregnant dogs, senior dogs, and sick or debilitated dogs, to wear the Scalibor collar. Please note that maximum efficiency will be reached three weeks after this tick collar is worn by your dog. Being one of the priciest anti-flea collars on the market, a lot of pet parents choose to only use this collar once a year for six months and rotate with another product. That way, parasites aren’t able to build up greater resistance over time. — Great Instant Knockdown Effect! 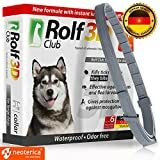 By killing fleas, ticks, larvae, and lice before they bite, the Rolf 3D Anti-Flea Collar is a very strong product basing its formula on a powerful trio of ingredients: Fipronil, D-cifenotrin, and Pyriproxyfen. It is not the cheapest tick collar out there but it will last for six months at very high efficiency. Because of its strength, it is not allowed to use this flea collar on puppies younger than 12 weeks. This dog flea collar by Rolf 3D is combating mosquitos, lice, fleas, and ticks, as well as preventing heartworm from sneaking in your dog. It also gets rid of larvae and therefore provides protection against all stages of such pests. Obviously adaptable, it comes in three different sizes: for small dogs (weight of 0-22lbs), medium dogs (22-65 lbs), or big dogs (over 65 lbs). Since this tick and flea control device is rather strong, check your dog’s skin out after a few hours and days of use to make sure there is no undesirable reaction. Review tend to be raving so do not worry too much, but just take some precautions! Effective over eight months, this flea and tick control protects dogs and puppies aged seven months and over. Its main active ingredients are very much natural and known for their anti-pest properties. There is also a total of six ingredients which is reassuring as many of them are essential oils rather than chemical-based compounds: cinnamon oil, eucalyptus oil, lemon eucalyptus, lavender oil, linaloe, and polyethylene. Because of its lack of strong pesticide, it is a gentler natural anti-pest collar for dogs, and wouldn’t be recommended for very active outdoors dogs. Ideally, this is a perfect flea collar for very young dogs and indoor family pets. It is made in Germany by DYEOF and the manufacturer defines its flea collar as hypoallergenic and free of any toxic chemicals. 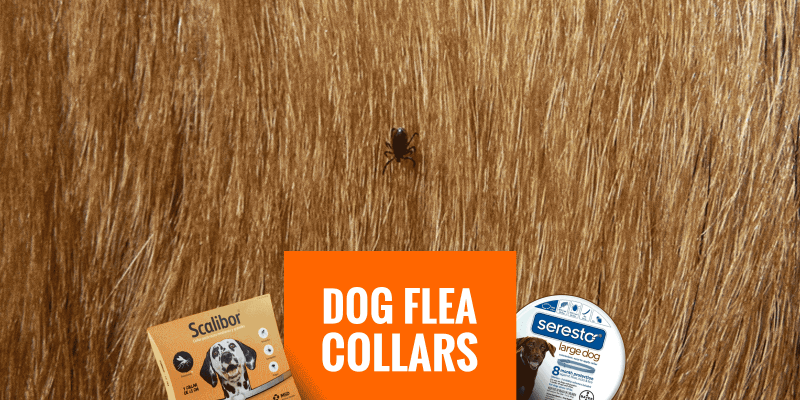 — Best Organic Botanical Flea Collar For Indoor Dogs! Efficient over four months, this non-toxic botanical dog flea collar is available in different sizes. Its active ingredients are strong essential oils proven to fight off fleas, ticks, and larvae on home pets. Essential oil flea and tick collars may not be common but they are efficient. Arava’s collar embeds lemongrass, eucalyptus, peppermint, clove, cinnamon, and thyme – all known for their efficiency! Arava flea-control collar is engaged in a continuous fight against ticks, fleas, larvae, lice, and even mosquitos. It is totally safe for your dog’s skin and has a long-lasting waterproof design. You can easily adjust it thanks to a comfortable design. Because dogs are all unique and sometimes a pet may react differently than the next, feel free to use the 100% satisfaction guarantee offered by the manufacturer. That way, you may try the product without risking too much besides sending it back and getting a quick refund. This is not the strongest product so we would recommend it for small and indoor dogs mainly. This product is available on Amazon and received great reviews from holistic dog owners. Over the years, we’ve received loads of emails from our audience about interrogations and worries they have about dog flea collars. We wanted to answer them publicly to the best of our current knowledge with the science and data available at the time of writing. Yes, flea and tick collars are safe for dogs if the right precautions are taken. 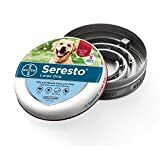 Modern flea collars such as Seresto and Salibor are recommended by experts because they emit safe levels of insecticides for dogs and their owners. However, there is no one size fits all approach and although flea and tick collars may be safe for dogs as they can sometimes pose risks to children or other pets. Certain chemicals are also more toxic than others. Organophosphates such as Tetrachlorvinphos appear in a lot of traditional older flea-control collars and have been listed by the US Environmental Protection Agency as toxic to wildlife and humans. Owners should always check labels, act responsibly and consult an expert if in doubt. Some dog collars are not appropriate for pregnant or sick dogs or those under 8 weeks old. It is also important to consider whether a dog collar may be suitable for your dog if you two or more dogs in the house as almost all insecticides could prove harmful if they are ingested by a dog who bites or chews another dog’s collar. Yes, generally flea and tick collars are effective as a preventative measure but not for treating infestations. In giant dog breeds, some products may be more effective around the head and neck of the dog where the collar is worn and less effective towards the rear of the dog where the chemicals are less concentrated. If fleas or ticks have already nested or laid eggs in your dog’s fur, there is no guarantee that a flea or tick collar will completely eradicate the pests. Most collars also have a time frame within which the collar must be applied for optimum success, for example, Seresto should be worn 48 hours before a dog is exposed to ticks which means prevention may not be fully achieved once an infestation has begun. Flea and tick collars are particularly effective in the prevention of fleas and ticks if a dog spends a large amount of time outdoors. This is where the risk of infestation is most prevalent. Flea collars have also become more durable. Nowadays, most of them boast water and sun resistance in order to improve and maintain their effectiveness in all conditions over longer periods of time. Flea and tick collars are effective as a preventative measure but not for treating infestations. Many dog owners who have been suffering from an infestation in the home can also put a flea and tick collar inside the vacuum cleaner bag so that fleas, ticks or eggs that are hoovered up will be killed, preventing further spread or reinfection. For a severe infestation in the home, dog owners may need to seek external assistance from pest control. This is usually dependent on the product purchased and can vary so it is important to always read labels fully. Most collars can be worn from between 3 and 12 months before they must be replaced. However, it should be noted that if a dog spends a large amount of time in water (either swimming or being bathed), then this may cut the lifespan of the collar in half as it may decrease in effectiveness and the collar may have to be replaced sooner. If you are treating your dog with other flea and tick medication the collar may need to be removed as to ensure that you are not exposing your dog to prolonged periods of high dose medication. Collars that have a lifespan of several months can be taken off and stored in an airtight container until they are next needed. Pest-control collars for dogs should always be changed if they become visibly damaged or chewed as this may compromise their effectiveness. The flea or tick collar should also be removed if it becomes apparent that it is in some way causing distress to harm to your dog or your family. There are certain insecticides used in dog flea and tick collars such as tetrachlorvinphos and proximur that have been thought to cause cancer in dogs and humans, although there is insufficient evidence to confirm this. Flea and tick collars often leave a residue which builds up in homes and pets and gets absorbed into our skin and ingested via our mouths. Unsafe levels of these toxins can build up in the body and may have harmful effects. Modern flea collars now have higher safety margins and tend to use safer, naturally occurring insecticides such as deltamethrin. Some are even homeopathic and rely on a blend of essential oils such as lemongrass and peppermint for their effectiveness. However, even homeopathic dog and flea collars can cause allergic reactions in dogs and humans and should be used with care. Yes, dog flea and tick collars can be lethal for cats. Cats and dogs are physiologically different, so they will be affected differently by different products – some insecticides which are harmless for dogs are lethal for cats, such as Permethrin. Unless a product has been specifically formulated for both species, it should never be used on both dogs and cats. If you are ever in doubt speak to an expert. If you own both a cat and a dog, it is also crucial to ensure that the product you use on your dog will not have a harmful secondary impact on your cat. Although they are not wearing the collar, the chemicals emitted by your dog’s collar could still prove lethal if encountered by your cat. It is also important to consider that cats and dogs also behave differently (i.e. cats climb higher and are more independent), so they are more likely to climb a tree or jump from a great height and get caught, increasing their risk of strangulation. Therefore, cat collars may be fitted with a more effective breakaway mechanism for this reason and this should be considered when choosing a tick or flea collar for a cat. 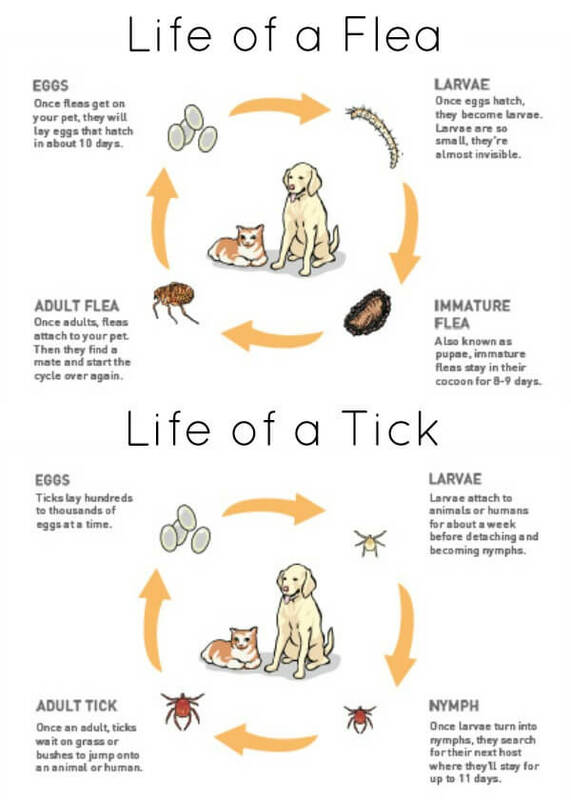 Overview of the lifecycle of both, ticks and fleas. Dog flea and tick collars are generally not recommended for puppies. As puppies are much smaller than the average dog, the dosage may be toxic, causing irritation or illness. Puppies are also much more playful and may be more likely to bite one another’s collar when playing roughly or chew one another’s collar off causing a potential digestive obstruction. Again, a mouthful of these toxic chemicals may be very dangerous for a small puppy. Veterinarians do not recommend getting a tick or flea collar for your dog until they are at least 8 weeks old even though some products claim to be safe for all breeds and ages. Before using any flea or tick treatment on a young puppy, it is always best to consult an expert. Horrible, toxic flea and tick control- all of them! Yuck! Do not use any of these on your breeding dogs.